Heat the oil in a frying pan and fry the spring onions and harissa paste for 1-2 minutes until golden. Using a bowl, stir this into the raw turkey mince with the apricots. Mould into 8 thick sausage shapes and thread onto 8 skewers. Place under a grill for 15 minutes, turning occasionally until golden and cooked throughout. Fill the pittas with rocket and top with the koftas. 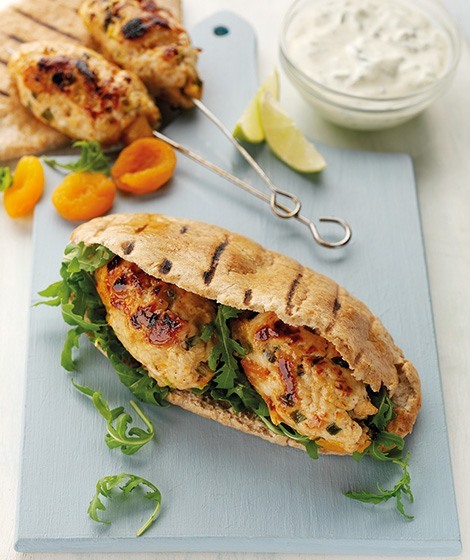 Serve with a dollop of tzatziki. Try using minced pork instead of turkey or serve as burgers in wholemeal rolls.